I don’t know anyone whose mental health isn’t affected by changes to their physical health, so it’s not surprising that fibromyalgia patients tend to suffer from depression and/or anxiety. 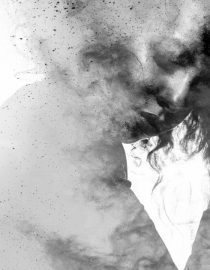 I’ve suffered from anxiety for a number of years, and I’m still not sure which came first – the anxiety or the fibromyalgia. In fact, to this day, I don’t know whether a fibromyalgia flare-up sends my anxiety through the roof, or whether a bad period of anxiety sends my body into a flare. Maybe it’s both. Maybe fibromyalgia and anxiety go hand in hand, both hovering away in the background until I am stressed or weak or exhausted, and then they join forces and hit me, picking on me when they know I can’t fight back. I’ve put a lot of effort into finding coping strategies for physical and mental pain, and although I know that I’m not going to cure these pains with a bit of deep breathing, there are things that we can do to help the symptoms if not the cause. Learning to the spot the early warning signs of when your anxiety is getting worse and taking control of it early is one of the best ways to manage your anxiety. Some of the tips below may help you to formulate a plan for coping with anxiety. I know, I know. It’s frustrating when people tell you to breathe, but it really does help to calm you down when you can feel yourself tensing. Some of my friends find mindfulness meditation on a regular basis helps, but I can’t rest my brain for long enough to feel the benefits. Instead, I find short intense bursts of breathing exercises help when I’m starting to struggle. Tip: Stand with your back against a wall or door and place your hands on your stomach, just under your diaphragm. Slowly breathe in through your nose and out through your mouth, concentrating on the sound of your breathing and the movement of your hands. Many of you will have been recommended a number of distraction techniques, especially if you’ve experienced CBT. Some people swear by Sudoku or crosswords, whilst others find plucking an elastic band on their wrist helps to shock them out of an anxious headspace. I recently wrote about art therapy and so far, that has been my best method of distraction. It’s not perfect, but it requires enough focus that you can’t give your thoughts the attention they’re demanding. If this doesn’t work for you, keep trying things until you find something that does. Tip: Try and find a distraction that can be taken out of the house so you can quickly engage your mind in something else whilst you’re at work or on the train. Often people with depression or anxiety are encouraged to exercise, but that’s pretty hard when you have fibromyalgia as well. Swimming is the only form of exercise that I have found helps my anxiety without interfering with my fibromyalgia too much. Unfortunately, swimming on its own doesn’t quite do the job for me, so I recently bought a waterproof iPod so I could listen to podcasts whilst I swim. I usually listen to talks about physical or mental health which I find both enlightening and inspiring. Swimming now provides both exercise and distraction. Tip: If you’re attending a public pool, try and go at quieter times when the environment is relaxing rather than finding yourself in the middle of the children’s swimming party. If you’ve read my previous articles or read my blog, you’ll know I’m pretty big on communication and talking about your invisible illnesses. I strongly believe that you can’t cope with fibromyalgia on your own, and the same goes for anxiety. If you feel like your fibromyalgia makes you a burden to your friends or family, it can be really difficult to then ask for further help when you feel anxious. Create a buzzword with those closest to you so that you can easily alert them to the fact you’re feeling fragile and you need a little bit more protection than usual. It will raise their awareness without you needing to talk about it at length; just do that when you’re ready. While none of these suggestions will get rid of your anxiety, but they might help you to make those anxious periods a little bit easier to deal with. If you need additional help, reach out to your doctor find anxiety treatment options or search for a therapist who you feel comfortable sharing with about your anxiety troubles.